To successfully earn the Faculty Innovation Fellow Badge, recipients must 1) attend the 2-day Innovation Fellows Retreat; 2) facilitate at least 5 or more sessions for their special interest group, 3) create materials to support knowledge building on their topic, 4) present at the Fall Faculty Conference, and 5) attend monthly Fellows Team meetings. 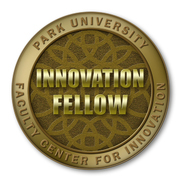 Faculty Innovation Fellows are selected as thought leaders for innovative teaching at Park University. Only 5 Innovation Fellows are selected via competitive application process each year and are provided with a stipend, release time, and resources to facilitate monthly Special Interest Groups on innovative teaching and learning topics. Fellows create multimedia resources on their specialized topic, present to the entire faculty body at the annual faculty conference, and promote a culture of collaborative knowledge sharing.